The famous California Gold Rush was so long ago and yet it has been such an integral part of the United States history that we would be hard pressed to ever forget about it. Gold was first discovered in the beautiful state of California in 1848. This incredible discovery was the spark that lit the fire on the biggest migration that has ever been seen in the entire history of the United States. During that time it was massive and culminated with more than 300,000 hopeful pioneers saddling up and hauling west. For those of us that weren’t around during this historic time, it can still be very exciting and informative to visit many of the gold rush towns that still exist today. If you’re up for taking this sort of trip then you’ll find yourself on the western edge of the Sierra Nevada Mountains in the Sierra Foothills in northern California. This is gold country. Sierra City is one of the most northern locations along the Sierra Foothills and it can be a realistic look at what mining was like back in the 1850’s. With an small population today, much of the city has been maintained exactly as it had been and feels like a trip back in time. Due to its higher elevation this was one of the most difficult mining towns to thrive in. The winters were exceptionally harsh and the living conditions left much to be desired. In fact, the dangerous winters won out one year when an avalanche took the entire town out in 1853. Over time it was rebuilt and it is a wonder to visit the town that has produced more than $30 million in gold. Placerville was once known by the ominous sounding name “Hangtown” and a sign that hangs today is still pleasantly reminding visitors of this fact. This quaint gold mining town was incorporated on May 13, 1854 but mining began much earlier in 1848 not long after gold was discovered in California. The mining location was actually named “Hangtown” because of Hangtown Creek where many of the camp mined. Many famous individuals took up residence in this town and you can still view their history during your visit. See where John M. Studebaker, Edwin Markham and “Snowshoe” John A. Thompson lived. Grass Valley is unique amongst other gold mining cities. It was originally found by a group of mean searching for their cattle, hence the name “Grass Valley”. Visiting the town you’ll get a glimpse at more than 150 years’ worth of mining history. This is still a sizable town with a small but steady population. While here you can learn about the world famous Empire, Northstar, Pennsylvania, and Brunswick mines. 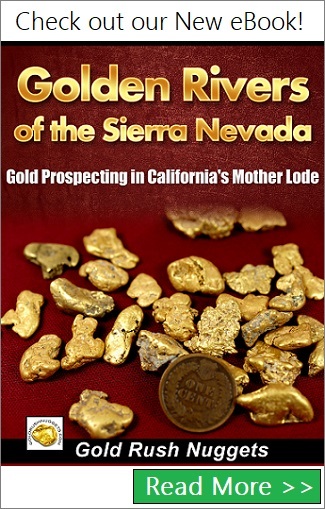 Both lode and placer mines were abundant during the height of the California Gold Rush, and miners are still pulling gold out of the surrounding rivers and creeks. One of the more southern cities of the California Mother Lode area, Mariposa was known for both its smaller stream bed operations and eventually the hard rock mines that were dug here. This town is still rich with mining history and is famous for its connection to the well-known explorer John C. Fremont. Fremont was a presidential candidate and an explorer that chose to have Mariposa as his place of residence in 1856. For more of the local history you can visit two museums in the area, the Mariposa History Museum and the California Mining and Mineral Museum. Georgetown, or “Growlersburg” as is the nickname given to it long ago was founded in 1849. The nickname comes from the fact that the hills in the area were full of gold filled quartz that the locals miners said would “growl” in their pockets as they wandered the town. Georgetown thrived long after many other towns had turned into ghost towns. They were lucky that the gold found here were solid primary deposits whereas most areas had placer deposits that were mined out more quickly. As you enjoy the town you can visit the town’s first post office that was built in 1851. There is no shortage of mining towns throughout the Sierra Nevada Mountains of northern California, although many of the once thriving towns are now little more than a memory. Some leave behind only a few relics as evidence of the booming communities that were once there. When exploring California’s gold country, enjoy the towns that you visit, and try to think back to what things were like during the time of the gold rush. It was the gold in these mountains that established California, and helped to settle the West.